I'm about to suggest something that you may find difficult to believe, but it needs to be addressed in any discussion of species extinction. There are many people who look favorably on the idea of making large numbers of species extinct, regardless of the economic consequences of that extinction. If they can make some money off of the matter, well and fine, but they take pleasure in species extinction even if there is no economic benefit, and even if there is probably some long term economic harm. I know that seems crazy, but it is the only explanation for some behavior. Now, why do they feel this way? I think it has to do with the way that politics interacts with personal psychology. It lets them feel "tough-minded" and assures them that they are not weak. Consider those people you know who are anti-environmentalist, who probably label themselves as "conservative." Do they ever refer to "bleeding heart liberals?" Do they use phrases like "soft on crime?" (Previously, there was "soft on communism" but that sounds a tad archaic now). Are they themselves "tough on crime?" Do they ever speak approvingly of "tough love" as a way to deal with problem kids? (In my observation, "tough love" is always about the "tough," never about the "love"). In certain political circles, any real show of compassion or sympathy is a sign of weakness. They derided Clinton because he "feels your pain." Clinton was weak. They know that the proper way to show sympathy for the victims of crime is to use the death penalty more freely. The way to show compassion for the inhabitants of poor nations is to cheer when they cut down rain forests. Under such a mind set, power is the only thing that matters, and anything that interferes with your own exercise of power is anathema. They want to drill for oil in the ANWR not in spite of the fact that it is pristine, but precisely because it is pristine--and as such is an afront to their complete dominion over the entire world. There are mathematical proofs, there are empirical tests, and there are good narratives. When push comes to shove, the good story gets more believers. Last year, at an SF convention, I attended a panel titled, The “Future in Oil,” which was about oil painting, and had three artists on it. One of them wound up talking about the difference between CDs and vinyl records (because a subject like oil painting tends to get a lot of artistic musing). The cherished narrative is that vinyl is better than digital. I did try to set the record straight, but there were true believers in the audience, as well as one tech guy who thought he knew what it was all about (he did not). I don’t try to win unwinnable arguments very often these days, though I do kvetch about it afterwards, hence this essay. In my own personal history, one of the most fascinating courses I ever took was a graduate level thing “Voice and Image Processing.” It’s been interesting watching the technology of voice, sound, and video over the past thirty years catch up to the things we learned in that course. Add to that the fact that I’ve also had a number of friends and acquaintances who were sound and music nuts, and I will claim some expertise on the subject. Whatever else may be said, I am not uninformed, nor am I lacking for opinions. So why do so many people think that vinyl LPs are better than CD? We’ll leave aside whatever buried agendas are being worked out (rebellion against the digital age, simple nostalgia, etc.). In fact, I’ll stipulate that many people have had experiences that are consistent with the hypothesis that vinyl is better than digital. Why? I know of three answers to that question, one kinda obvious and unsurprising, one that gets seriously arcane, and one that’s just counter-intuitive. Let’s first take the one that’s unsurprising. In the production process for making an LP or CD, there is a thing called the “Master” tape, which is mixed, balanced, and frequency adjusted for the medium. Not surprisingly, CDs and LPs have different frequency responses. In fact, the old LPs had a lot of special things done to the frequency response to compensate the need to put all the sound in those little, inherently noisy, grooves. Then, on playback the “phono” jack on the pre-amplifier had a frequency response curve built into it to undo all those special tweaks. The net result was an RIAA standard “compensation curve” built into the master, to achieve closer to a flat frequency response for the final product. Then there was the fact that early CD players weren’t up to properly implement the theory of sound sampling. To understand what went wrong there, let’s start with the Nyquist Sampling Theorem. Short version: you can perfectly reconstruct any wave form like a sound signal, provided you sample it at a rate that is at least twice the frequency of the highest frequency in the signal. In the above noted course, we actually went through the proof of the NST, and while I can no more reproduce it than you can reproduce an aria by sampling it at ten samples per second, I did once know it well enough to have the sort of belief in it that qualifies as “faith” for my kind. So CDs use a standard that samples at 44,000 samples per second, which, theoretically can perfectly reproduce sound up to 22 kHz, but actually is set up to go to 20 kHz, because you need to put in a high frequency cut-off. See, if you try to reproduce sound at something less than the Nyquist rate, you get a phenomenon known as “aliasing,” where the lower frequencies also have an “alias” signal that is frequency shifted up to higher frequencies. This isn’t the same as a harmonic, because the frequency shift is related to the sampling rate, not to the original signal. I’ve heard aliased sound, and it’s one of the most unpleasant things I’ve ever heard, but I can’t think of any analogies for it. It just sounds alien and wrong. So above 22 kHz in the analog signal that is reconstructed from a CD, you get this horrible noise. You can try to filter it out of the analog signal, but filters are imperfect, so some faint residual alias remains. Worse, real circuits have some slight non-linear responses, non-linear in the mathematical sense, not in the sense of a “linear frequency response.” What a mathematically non-linear effect can do it to take a high frequency signal and leak some of it to a lower frequency. Thus, the aliased signal above 22 kHz could result in some faint distortion down where even hearing-damaged Boomers could hear it. The aliasing problem was eventually solved by digital filtering. What later generation CD players do is to use “oversampling.” Basically, the original 44,000 samples per second is converted through interpolation to many more samples (12X oversampling is common). Then, use a digital filter to make damn sure that there aren’t any aliased frequencies in the thing, so when you finally do the digital-to-analog conversion, you only need a pretty good high-frequency cutoff filter. This winds up being both effective and cheap. Win/win. Finally we come to the strange one. I think I saw it in Science a couple of years ago. I’m not even sure if it spoke to the issue with CDs vs LPs, but the implications were obvious, even if the result was counter-intuitive. Simply put, our perception of sound is such that we hear things more clearly if there is a little bit of low level noise in the mix. I think the speculation was that the noise allows us to “calibrate” our perceptions on the fly. Whatever the reason, it flies in the face of everything in sound reproduction in the past century. Noise is supposed to be your enemy, not your friend. But the implication is that the slight surface noise that you get on even the best turntable with an LP actually assists your sound perception. Go figure. In any case, I’ve made CDs of vinyl LPs; not all LPs have been re-issued, and besides, I don’t like buying the same thing twice. I’ve listened to the resultant CDs, and I don’t believe that anyone can tell the difference between the CD and the source LP. Furthermore, there have been many, many, controlled A/B tests of whether or not anyone can tell the difference, and it’s a simple fact that whatever differences there may be, they are imperceptible to human beings. And if that’s not enough, Frank Zappa looked into the matter and he agreed; CDs can perfectly reproduce vinyl, if you want them to. None of this will convince anyone who is sure that LPs, vinyl, and analog are better than CDs and bitstreams. Vinyl is “organic” (which is perfectly true in the chemical sense), while CDs and digital are harsh and artificial. And that’s a simple narrative, as opposed to what I’ve just described, which is convoluted (little math joke there) and knurdish. I’m fine with that; I’d rather be right than win an argument. I know a lot of amateur scholars, including myself (ask me about New York City circa 1911 sometime). Many of them concentrate a fair amount of their scholarly impulses on science fiction, and that includes my friend Douglas. He’s taken advantage of the fact that U.C. Berkeley has a collection of the papers of A.E. van Vogt, for example. He also tells me of a movie review of Metropolis written by H. G. Wells. Wells was highly critical of the movie, on science fiction and futurist terms. Specifically, Wells noted that the economics of Metropolis was simply non-functional. In the city, there is a small, wealthy class that owns everything, while there is a much larger class (literally an underclass, because they live in the city’s depths) of workers who produce all the goods. Nonsense, says Wells. This makes no sense. The number of workers, plus modern manufacturing, would produce vastly more goods than the small wealthy class can consume. Who buys the rest of it? There are a couple of points worth noting here. One is that the society in Metropolis is very similar to Wells’ own book When the Sleeper Wakes, written 25 years before Metropolis. The second is that Wells belonged to the Bloomsbury Group, a collection of artists, writers, and other intellectuals, that included John Maynard Keynes. I suspect that Keynes once made the same economic critique to Wells, about Sleeper. Wells then passed it on. Can one even find a dystopian future story that doesn’t contain the extremes in wealth and power trope? Harrison Bergeron by Vonnegut comes to mind, since it, at least on the surface, was about forcing everyone to the same level. But scratch the surface and there’s the Handicapper General wielding power over everyone. Maybe that Twilight Zone where everyone has plastic surgery to look the same manages it. For that matter, the highly unequal version of society isn’t confined to obviously dystopian works. Often it seems like the standard view of what’s to come, as if no one can really come up with a credible alternative. If science fiction is a reflection of everyone’s hopes and fears about the future (and that’s surely one feature of our genre), what does it say that everyone has in the back of their mind a view of an undemocratic, faux feudal society, with the masses falling prey to a few predatory rulers? And if this vision of the future is the default, it certainly makes sense for people to engage in class warfare as a sort of full contact musical chairs, with the expectation that the winners and their progeny will have the rest of time to enjoy the spoils of the Social Darwinian State. If you try to light a match under micro-gravity conditions (we all got used to “zero-g” so some smarty pants had to go and call it “micro-gravity”) and just hold it in one place, it will self-extinguish. The match will use up enough of the oxygen in its surrounding volume of air to extinguish the flame. It doesn’t have to use up all the oxygen, either; most flames go out in air that still has enough O2 in it for people to breathe—barely. Your basic candle flame is fed fresh air by gravity, specifically, the air coming in to replace the hot gases that have become lighter than air in the hot flame. That’s called the “fire draft” and fireplaces exist to direct the fire draft upwards, so the smoke doesn’t choke the people warming themselves by the fire. The chimney/flue of the fireplace also accelerates the fire draft if you build it right, and both Ben Franklin and Benjamin Thompson, (Count Rumford), invented some tricks that are still in use. So fires always produce an updraft. In truly big fires, the question becomes how the updraft interacts with the local weather. If the local winds are stronger than the updraft, and the fire is big, uncontrolled, and uncontained, you have a conflagration. If the fire creates its own winds, you have a firestorm. Neither is anything you or I want to be near. A running wildfire can exceed 70 mile per hour under upslope flow conditions, where the fire draft adds to the natural winds. Firestorms generate their own weather, their own winds, and can create small tornadoes, “dust devils” made out of flaming gases that light everything they touch. The heat in the interior of a firestorm pyrolizes everything within its boundaries, but the fuel produced exceeds the air available. So the hot mass rises as a fireball, sucking more air into it, maintaining its heat even as it expands, because there is still plenty of fuel gas left to burn. A firestorm spreads as much by thermal radiation as by flaming contact, sometimes triggering fires at a distance, like across a valley. Kurt Vonnegut lived through the firebombing of Dresden, and wrote about it, so more people know about the 35,000 people who died there than in Operation Gomorrah, which killed a larger number (50,000 est.) 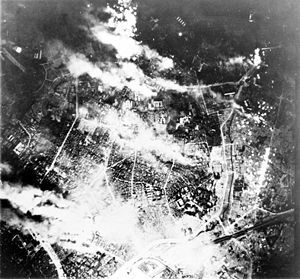 in Hamburg, or the 120,000 who died in the Tokyo fire raids. I’d never even heard of the raids on Kassel, Braunschweig, Darmstadt, Heilbronn, Pforzheim, and Würzburg until I looked them up for this essay. But fires are tricky to set with conventional incendiaries. Most of the WWII fire raids were duds, or semi-duds, producing some fires, but nothing like a real firestorm. There were four attempts on Hamburg before they hit the jackpot. But Hiroshima was a jackpot; what the first blast didn’t do, the subsequent firestorm did, and 4 square miles of the city just went away, nothing left, not even steel, much less teeth and bones. The Nagasaki bomb was bigger, but the targeting wasn’t as good, and the city had the good fortune of having a lot of hills, which shielded some from the blast, the heat, the radiation. Moreover, the hills altered the wind field, and the resulting fires are only classed as a conflagration. Still, 40,000 people died quick, and maybe four times that number died slow, from injuries, from radiation, from the long term illnesses that go with radiation, from trauma, and grief. In 1944, the most powerful bomb used in warfare was the British Grand Slam on the order of 10 tons of TNT, although the U.S. developed (but never used) one that was twice as big. In 1945, of course, nuclear weapons increased bomb yields by three orders of magnitude. It’s hard to develop a sense of scale once you start dealing in factors of a thousand. People think “nuke” and think “Hiroshima and Nagasaki.” But those bombs were measured in kilotons. Thermonuclear weapons are measured in megatons, another factor of a thousand, so we got a factor of one million increase in about half a decade. Go look for pictures of atmospheric bomb tests. See that one near the mountain? You can see the billows in the clouds and dust that it shakes up the near field. That’s a bomb that’s in the kiloton range. There have been industrial accidents that can be measured in kilotons, like the Pacific Engineering Company plant in Henderson, Nevada, where over a thousand tons of ammonium perchlorate blew up. That was a kiloton explosion. Now go find some photos of the Pacific island H-Bomb tests. Google on “Castle Bravo” for example, the biggest miscalculation in the history of nuclear weapons. It was supposed to produce 6 megatons; instead they got 15. “Castle Romeo” was part of the same mistake. They expected 4, but got 11. See those shapes in the sky above the mushroom cloud? That’s the stratosphere. The thermal radiation effects of nuclear devices loom larger as the energy release increases. In Hiroshima, the firestorm was likely caused by the blast itself, in the same way that an earthquake causes fires, by turning building into kindling, by releasing natural gas, by rupturing fuel tanks. The heat from the bomb itself probably lit only a few of the fires. But megaton blasts, perhaps over grasslands, forests, farms? The experiment has yet to be preformed. And calculations, simulations, and estimates are so very, very unsatisfying, aren’t they? I don’t always know what I like, but I do know art. Whatever. One of the pieces on display was Robert Rauchenberg’s Monogram. Monogram is a “mixed media” piece; that's a stuffed goat halfway through an old rubber tire. In the exhibit I saw, I think the tire had a rope on it going to the ceiling, like an old tire swing. I rounded the corner into the room where it was displayed—it was right in the middle of the room—and I just cracked up. I mean, the thing is just hilarious, the silliest sexual visual pun I’ve ever seen in a museum, I’m pretty sure. So after looking at it for a while, walking around it, checking out the collage-y thing the goat is standing on, appreciating just how apt the expression on the goat’s painted face, I began to notice the reactions of other people who came into the room. Or, more accurately, the lack of reaction. I don’t think I saw a single other museum goer even crack a smile. Certainly no one laughed out loud. And I thought, what a pity that is. I’m sure Rauschenberg had humor in mind when he created the piece, and it’s fairly easy to find critics (oh, those much maligned critics) who reacted with amusement. But the folks trudging through SFMOMA weren’t going to give in to such an easy thing as laughter. I understand that we’re taught to “behave” in museums, and museums, like libraries are supposed to be places where you whisper. But it’s not like the museum guards are going to kick you out for a snicker, or even a good guffaw. This isn't a test. There is no right answer in the back of the book. It doesn't have to be "about" anything, or about any one thing. If it looks like something, if it reminds you of something else, well and good. If not, maybe it just looks good. If you don't like the looks of any given work of art, move on to the next piece. There's plenty of all sorts of art around, enough for everyone, really. You can laugh at it, too. Sometimes that’s what the artist had in mind. And if it wasn't, so what? What is he or she going to do, kick you out of the museum? Okay, here's the thing. In the midst of a general sort of argument about whether or not Barry Bonds is the Antichrist (or at least the Anti-Aaron), I got to looking into the laws behind the steroids scandal, and came upon a quandary that I have not been able to penetrate. In the late 80s, in response to the "designer drug" craze, where "rogue chemists" (I would love to see "Rogue Chemist" on a business card), were making new and wonderful drugs faster than the authorities could outlaw them, Congress made some amendments to the Controlled Substances Act, one of which is sometimes called the "Analog Substances Act." This passed authority to the Attorney General, and by delegation to the DEA, to render judgment on whether or not something was a bad old mean and nasty recreational, I mean, high abuse potential, drug. The Supreme Court held that this was not an unconstitutional conveyance of powers from the Legislative to Executive, so all systems were "Go" for a DEA crackdown, despite the fact that the law was kinda vague on exactly what procedure was to be used to tell if some designer drug was an immoral scourge. Sometimes a minor modification in structure can make a king hell narcotic into, well, basically just something with a long name and no biological effect to speak of. Other times, things that are completely dissimilar in structure will have similar effects. It's rather hard to tell, in fact. Nevertheless, the DEA may not know drugs, per se, but it can tell when people are up to no good. They have almost a seventh sense about that sort of thing. So they keep busting people for stuff; that's their job, after all, both busting people, and stuff. Then we get the BALCO case, all sorts of famous sports guys, and well, we're off to the races, and the ball park, etc. And BALCO President Victor Conte of San Mateo, BALCO vice president James Valente of Redwood City, track coach Remi Korchemny of Castro Valley and Greg Anderson of Burlingame, Barry Bonds' longtime friend and personal trainer, all pled guilty to drug-related crimes. And some of those involved non-analog drugs, like EPO, and testosterone cream. Then last year, Patrick Arnold, 39, of Champaign, Ill., pled guilty to "conspiracy to distribute anabolic steroids." He was the chemist who invented "The Clear," an at-the-time undetectable steroid, plus several other drugs in a similar vein (damn it's hard to to avoid the puns here). But here's the thing. The 1986/87 law that gives the DEA to power to declare a drug an "analog" does so for Schedule I and Schedule II drugs. Steroids are Schedule III. So it's not actually obvious to this oh-so-untutored-in-the-law observer, that what Arnold did in developing and helping to distribute those drugs was, technically, illegal. What is obvious, however, is that the DEA had Mr. Arnold by the short ones, with a ton of other things they could indict him for, and what he got was three months in prison and three months of home detention. What the DEA got was a precedent that looks a lot like it gives them the authority to classify Schedule III drugs as analogs. It's probably just my ignorance, but it looks to me like the DEA just pulled a fast one. And they did it using steroids. There's a concept in economics called "elasticity," more specifically, the “price elasticity of demand.” This is a concept in microeconomics, though experience tells me that it is often mistaken for macroeconomics. I have several theories about why that is, but simple ignorance is probably the real reason. Most commodities have a relatively inelastic demand response to price changes, which is one of the reasons why firms try so hard to remove themselves from the task of supplying mere commodities by branding, or otherwise differentiating what they sell from the products of other firms, with copyright or patent protections, or some sort of barrier-to-entry strategy. One can also take advantage of commodity pricing on the upside, when there are supply crunches. The money Exxon makes from a supply scarcity of oil and gasoline (oil production or oil refining) is one such upside; oil firms literally make more money by supplying less gasoline. The electricity shortages in California a while back are another example. But economics is a social science, and in social sciences, the “science” is often subverted by the “social.” That was the main sermon that the late John Kenneth Galbraith preached during his lifetime, and it took me longer to get it than it should have, partly (I will alibi) because he often used arguments that weren’t particularly strong. He argued, for example, that advertising does nothing but create artificial demand, and worse, that it made firms immune to consumer choices. I’d have loved to see his analysis of the “New Coke” but I don’t think he ever made one. Still, agendas matter, and that is nowhere more obvious than in economics, and especially economists and their fellow travelers. There is a political philosophy afoot that holds “the market” (or “the free market”) to be some sort of moral fairy dust that can be sprinkled onto any policy to turn it into a just and moral action. This does, however, require some interesting mental gyrations on the part of the true believers. Consider this analysis of the Minimum Wage, a tried and true policy of the advocates of labor. The basic argument in favor of the minimum wage should not be controversial: demand for the lowest economic value labor (sometimes called “unskilled” by those having never worked a minimum wage job) is inelastic, as befits a commodity. This means that a minimum wage above the “market clearing price” will result in some marginally lesser employment rate, but the margin will be proportionally less than the marginal increase in wages mandated by the minimum wage. In other words, the winners get more money than the losers have lost. This additional money must come from somewhere, of course, and traditional theory suggests that it comes from the business owners (and possibly managers) that have to pony up the additional wages. Now there is a debate within the economic community as to whether or not there is any loss of employment in the minimum wage class (or in the overall labor force), at least for small enough increases. This might simply mean that the loss is too small to measure, given the other noise in the system, or it might actually mean that the increase in demand caused by a higher minimum wage (more money in the pockets of those who spend it), has a stimulative effect on the macroeconomics of the situation. In effect, minimum wage workers have more money to spend at Walmart, so Walmart has to hire more minimum wage employees. This is sometimes called the “Ford effect” because Henry Ford supposedly paid high wages to his workers so they could afford to buy automobiles. But there isn’t really any way to make the case that the minimum wage hurts workers in general, because it simply isn’t true, and there is no intellectually honest way to make the economic argument that it does. Nevertheless, I have seen quite a few articles, by economists, saying exactly that, in so many words. I remember one in particular, from an economist at Pepperdine University (the economics department at PU being essentially another right wing think tank, as is the one at George Mason University), that decried the terrible result that raising the minimum wage would have on the unemployment rate of black teenaged males. What are the odds that said economist has ever been concerned about the employment prospects of black teenagers in anything other than a context of arguing against policies that would actually result in monetary loss to large corporations? But here’s where this all goes very meta. I once wrote more or less the same thing as the above in a posting to a Compuserve Forum. The result was that several other participants (who would all, I suspect, classify themselves as libertarians), simply refused to even acknowledge the argument, and castigated me for being so callous toward the unemployment that would surely result from a minimum wage hike. They were prepared to argue the does-it-or-doesn’t-it-cause-unemployment question, but the more general case of quo bono simply did not register. Yet every one of them believed that he understood economics. And the women wicky wacky woo! One summer morn in nineteen five and forty. Turn around, go back down, back the way you came. And the crowns had barely opened on the flowers. I mean, they hurry a hurricane. Then your troubles increase, boy! By jingo, boys, worth that price!